The Eastern States Trade Lamb Indicator (ESTLI) continues to hold its ground in the face of strong lamb throughout figures being recorded in South Australia and Victoria, closing yesterday just 1¢ softer at 610¢. East coast mutton was even more defiant in the face of above average saleyard numbers to see an 8¢ gain to 461¢/kg cwt. The East coast lamb throughput posted a 22.5% increase on last week and is sitting 28.4% above the five-year average for this time in the season – figure 1. NSW lamb yardings trekked sideways on the week but remain 22% above the seasonal average level. Although the big boost to East coast yardings is coming from SA and Victoria. Figure 2 highlights the surge in SA lamb throughput at 52,251 head; the highest weekly lamb yarding recorded since 2008 to see throughput levels soar 60% over the five-year average for this time in the season. Victoria is adding to the East coast glut of lambs with over 120,000 head recorded at the saleyards this week. Victorian lamb throughput was also higher than the five-year average this week, sitting 23.5% above the seasonal level. 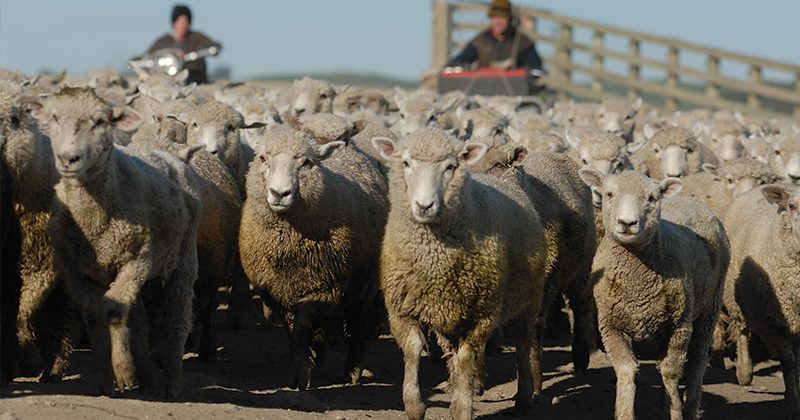 The increased numbers are currently dragging down each states respective Trade Lamb saleyard indicator, with Victorian Trade Lambs posting a 3.4% decline (600¢/kg cwt) and SA off 6.1% (574¢/kg cwt), based off the MLA mid-week saleyard report. Stronger than average East coast mutton throughput levels were recorded too. This was aided by higher NSW figures, to see an 8.6% increase in saleyard numbers and the trend continuing to trek along the upper band of the normal range – figure 3. NSW mutton yardings were up 15.7% on the week, pressuring NSW mutton at the saleyard to see them ease 4¢ to 400¢/kg. Softer Victorian and SA mutton throughput is providing some support to prices there with Victorian mutton up 20¢ to 420¢ and SA gaining 8¢ to 410¢/kg cwt. Price support is likely to remain from continued rainfall forecast across much of Victoria and NSW next week, with much to these two states expecting between 25-50mm. Although, increased Victorian yardings are likely as the Spring flush continues, so that will act to help counterbalance the recent and forecast rains. On balance, the ESTLI is likely to ease into the week ahead to test sub 600¢, but don’t expect a huge drop.